This article is shared with permission from our friends at youngandraw.com. I often hear people saying that snacking is bad, but in fact, it isn’t bad – it’s what we choose to snack on that can make snacking unhealthy. One way to make healthier snack choices is to prepare your snacks for the week so they are ready to go when you are. Bad snack choices be gone! Read Next: 12 Healthy Snacks You can Indulge in After 7 p.m.
Bananas are one of my all time favourite energy boosting snacks. Not only are they delicious and satiating but they are also chocked full of iron, potassium, B6, B12 and magnesium. Bananas also help reduce blood pressure, regulate glucose levels and are a natural antacid – seriously, if you suffer from chronic heartburn, swap those store-bought antacids with a piece of banana! Planning on a run or a bike ride? A pre-workout banana will provide you with carbohydrates that will help increase your energy production or try a banana after you sweat to help replenish some of the nutrients your body naturally loses after a great workout. Instead of just throwing a banana in your bag, why not try making my delicious and nutritious Easy Bake Banana Chips. You can make a batch ahead of time and have a great on-the-go snack for the whole week. Plus, they’re free of refined sugar, sodium and other unhealthy additives that you would find in regular potato chips. This simple, inexpensive and guilt free snack will help re-energize you throughout your day and is great for the whole family. Make some tonight! You can use a dehydrator or an oven for the recipe. If you are using a dehydrator tray, place your bananas in your dehydrator for 6 hours. If you are baking, place your bananas onto a baking tray on parchment paper and bake at 250 degrees for 1 hour or until your desired crispness is reached. 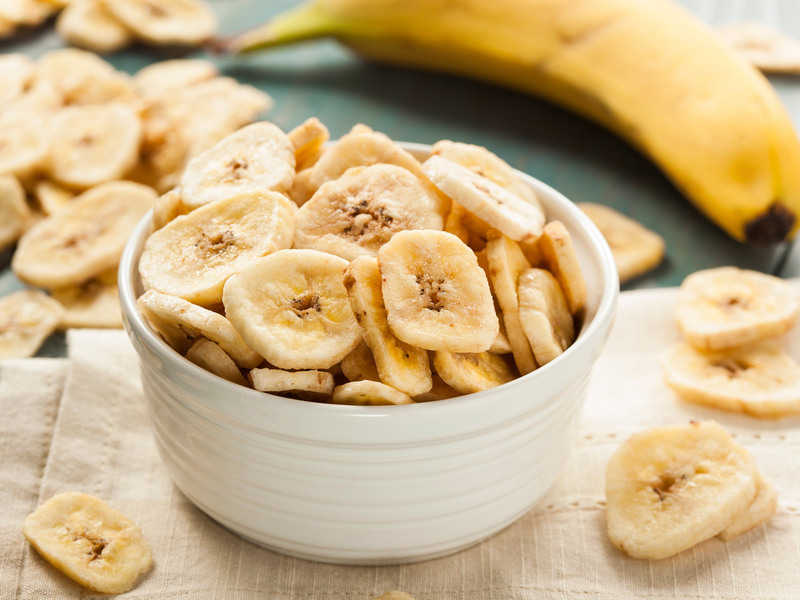 Store your banana chips in an airtight glass container and consume within 2 weeks. Young and Raw is a place for people to learn about the healing and cleansing benefits of real food! We provide 21 day and 90 day cleanses, raw food meal plans and ebooks on healthy living. Our team of Nutritionists, Naturopaths and other qualified individuals assist in the creation of our programs.